On Thursday of this week the NFL will hold its 81st annual “selection of college players,” better known as the NFL Draft. Over the three days (April 28-30) the thirty-two NFL teams will select 253 players. Looking back over eight decades ago nobody would have imagined that the first NFL Draft back in 1936 would become the mega-media, multi-day event it has become today. On May 18, 1935 NFL President Joe F. Carr and eight NFL owners (Cardinals owner Charlie Bidwill missed because of sickness) gathered at the Fort Pitt Hotel in Pittsburgh to discuss some pressing matters. Starting at 12:15 p.m. Carr and the owners got down to the most important business of the meeting. Taking the floor Philadelphia Eagles owner Bert Bell raised a motion that changed the NFL forever. 1. At the annual meeting in February , and each succeeding year thereafter, a list of first year eligible players to be presented to each club, and their names placed upon a board in the meeting room for selection by the various clubs. The priority of selection by each club shall follow the reverse order of the championship standing of the clubs of the preceding season; for instance, the club which finished last in either division, to be determined by percentage rating, shall have first choice, the club which finished next to last, second choice, and this inverse order shall be followed until each club has had one selection or has declined to select a player, after which the selection shall continue as indicated above until all players names appear on the board have been selected or rejected. 2. Any first year player who is not so chosen, or whose name does not appear on the list referred to above, is eligible to sign with any club in the League. 3. If for any valid reason it would be impossible for a player to play in the city by which he has been selected, of the player can show reasonable cause why he should be permitted to play in a city other than that designated for his, then through such arrangements as can be made by sale or trade with another club, he shall be permitted to play in the city he prefers, if the President of the League approves his reasons as valid. 4. In the event of controversy between a selected player and a club, the matter shall be referred to the President, and his decision shall be accepted by all parties as final. 5. In the event a player is selected by a club and fails to sign a contract or report, he shall be placed on the reserve list of the club by which he was selected. The motion was carried unanimously. President Carr and the other owners realized this was an idea that was best for the league. The NFL could maintain what has now been labeled as “competitive balance.” Back then it was just a way of not killing off the weaker franchises to stock pile the strong teams. “I thought the proposal [was] sound. It made sense. Tim Mara also approved. He and I had more to lose than any other team. With our support the proposal was adopted,” recalled Chicago Bears owner George Halas. “People come to see competition. We could give them competition only if the teams had some sort of equality, if the teams went up and down with the fortunes of life. Of course, that meant that no team would in the future win a championship every third year and people would start saying, ‘What’s happened to the Giants? They aren’t the team they used to be.’ That was a hazard we had to accept for the benefit of the League, of professional football and of everyone in it,” commented New York Giants owner Tim Mara about the new arrangement. Carr and the NFL owners seem to be on the same page with this issue and it would eventually be one of the biggest foundation blocks of the big-city League. 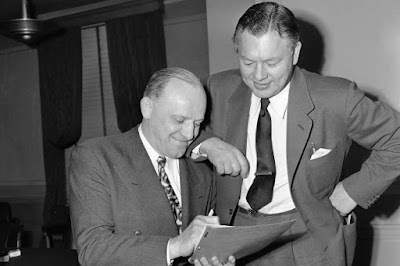 After the 1935 season the next NFL owners meeting would take place on February 8-9, 1936 in Philadelphia. Based on the motion brought up by Eagles owner Bert Bell in 1935, this meeting would mark another big milestone in NFL history. The league would conduct the first ever NFL draft. But in 1936 Carr and the owners did not call it the draft. 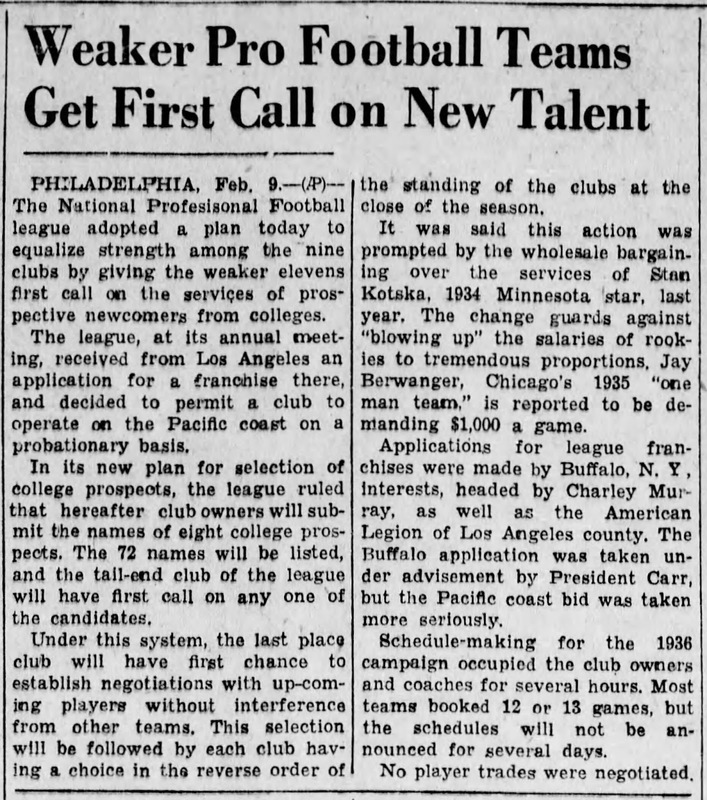 In the league minutes they called it the “selection of players,” while the press usually referred to it as the “selection of college prospects.” In 1937 the league would start to call it the“Draft” in league minutes. The other fresh face, literally, was that of twenty-year-old Wellington Mara, who joined his father, Tim, and older brother, Jack, at the gathering. Young Wellington had now been around the NFL for eleven years and knew mostly everyone involved- including President Carr. “Joe Carr was such a good man. He was a great listener. I can remember him sitting at meetings with his glasses down at the end of his nose listening intently,” recalled Wellington Mara. This first meeting and the NFL draft was an eye-opener for Wellington. Soon he would make the league’s biggest contribution on draft days. Although the Lions were NFL champions, the order went by winning percentage, thus giving the Giants last pick in each round. But that didn’t hamper them at all because they had a secret weapon at the selection meeting- Wellington Mara. In the next hour or two, the nine NFL teams selected eighty-one college stars from a variety of backgrounds and schools. With the number one overall pick, Bert Bell selected the best player in the country. 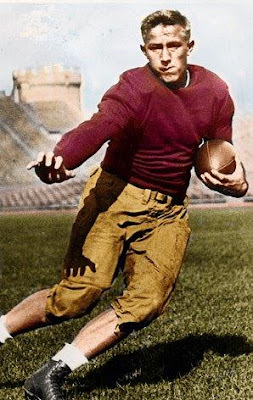 Heisman Trophy winner Jay Berwanger, a halfback from the University of Chicago, went down in history as the NFL’s first ever draft pick. But he didn’t belong to the Eagles very long. George Halas wanted Berwanger really bad and offered veteran tackle Art Buss to obtain the rights to get him. Bell couldn’t pass up the offer, as signingBerwanger would be very difficult. Rumors had circulated that Berwanger didn’t really want to play professional football, and was asking for $1,000 a game: “I haven’t made up mind yet. I haven’t signed with the Bears, but I believe the decision at Philadelphia means the Chicago club has an option on my services if I decide to play pro football,” said Berwanger to the Chicago Tribune. In the end Berwanger didn’t sign, choosing to work for a private business, and never played pro football. The second overall pick Riley Smith, a halfback from Alabama, did and spent three productive seasons with the Boston-Washington Redskins. Probably the most famous name to be drafted that first year was another Alabama star, end Paul “Bear” Bryant, who was selected in the fourth round (number thirty-one overall) by the Brooklyn Dodgers. Bryant didn’t sign either, but, of course, went on to be one of the greatest coaches in college football history at his alma mater. Out of the eighty-one players drafted in the first NFL Draft, only twenty-four signed and played in the league in 1936 (four more would play in 1937) with several having Hall of Fame careers. The Bears (behind the drafting of George Halas) took two future Hall of Famers in the first draft. First rounder Joe Stydahar, a tackle from West Virginia, and ninth round selection Dan Fortmann, a guard from Colgate. 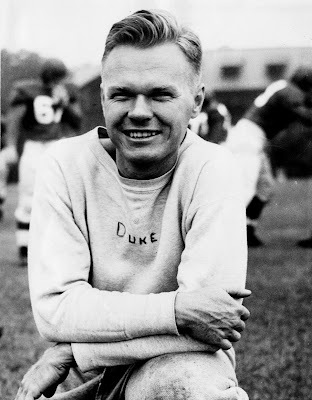 The Redskins drafted end Wayne Millner in the eighth round, who would have an early impact for the Skins in 1936 by finishing fourth in the league in receptions. The fourth and last Hall of Famer to be drafted in 1936 was second rounder Alphonse “Tuffy” Leemans, a halfback from George Washington University, by the New York Giants. Leemans was selected by the Giants on the recommendation of young Wellington Mara. Although he was only a junior at Fordham, Wellington had already immersed himself into what was going to be his life’s work- guiding the New York Giants. His special forte was judging talent. He kept files and notes on hundreds of college players and one who caught his eye was Tuffy Leemans. Wellington suggested to his father that Leemans was going to be a great player and wanted to go to Washington and visit with him. Tim Mara said, “Go ahead” and off he went. “I sent a telegram [to Leemans] setting up a meeting and signed my father’s name to it,” Wellington Mara recalled years later. “It was to be in front of the gymnasium at George Washington. When I got there, he thought I was a kid who wanted an autograph. He looked at me, strangely suspicious, and said he was meeting Tim Mara, owner of the New York Giants. But I was able to eventually convince him that I was in fact a legitimate emissary, and he did listen to me. And, of course, we got him for the Giants.”Leemans would go on to play eight great years for the Giants. The Leemans pick was just the start to young Wellington’s NFL career. Selected by the New York Giants, Phil Flanagan a guard from Holy Cross, was Mr. Irrelevant as the 81st and last pick of the 1936 NFL Draft. He did not play a down in the NFL. The NFL’s first draft was a complete success (just the fact that it was now in place) and eventually it would give the NFL another building block to lean on. Over time franchises would use the draft to build their teams and create dynasties. 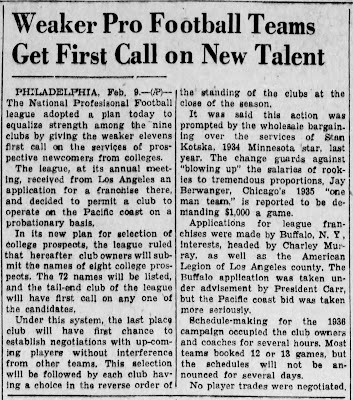 In 1936 it would establish a more balanced league, as the NFL would see two new franchises win division titles that first season- Boston and Green Bay. The Draft would be held in late November-December-January most years until the NFL finally moved it to the spring permanently in 1976. Besides Jay Berwanger and “Bear” Bryant (or a few Hall of Famers) the first NFL Draft also had a few nuggets and stories from some of the players drafted. Ed Smith was a star halfback at New York University. He was selected in the third round, number 20th overall, by the Boston Redskins. He would go on to play one year with the Redskins (1936), playing in the 1936 NFL Championship Game, and one year with the Green Bay Packers (1937). After suffering a knee injury he retired after the 1937 season. Smith eventually worked decades for Otis Elevators in New York City before retiring in 1976. But in the fall of 1935 Ed Smith was hired by a friend to do a job that would make him famous and immortal. In 1935 New York sculptor Frank Eliscu was asked by the Downtown Athletic Club to come up with a suitable trophy for an award they were planning- an award for the best college football player in the country. It was to be called the Heisman Trophy after long-time coach John Hesiman. The club would pay Eliscu $500 for the project. As Eliscu began sculpting wax images of the trophy, one was a player making a tackle, another was a player carrying the ball with his arm out. Eliscu liked the ball carrying but wanted the statue to look more life-like so he called an old friend. So he contacted Ed Smith, a former high school classmate at George Washington High School in New York City’s Washington Heights neighborhood, to pose for him. Smith did not realize that the sculpture, for which he posed, became the fabled Heisman Trophy until 1982. “He never told me what it was for, and I never asked,” said Ed Smith to Sports Illustrated in 1988. Smith did not find out what the project was until 1982 when Bud Greenspan, the producer of the Heisman telecast that year, contacted him. “At first I thought it was a crank call. Then what he was saying sank in. I couldn’t believe it. It almost threw me off my feet,” recalled Smith. Smith died on January 29, 1998 at the age of 84. After graduating from Stanford and “deciding he’d had enough football,” Reynolds moved back to his native Oklahoma and worked in the oil business in 1936 and 1937. Reynolds had been drafted by the Packers, but decided not to play professional football. In 1937, G.A. Richards, a millionaire radio station owner who also owned the Detroit Lions, invited Reynolds to come to Detroit to talk things over. Reynolds told Richards he had no interest in playing for the Lions, but noted that he did have an interest in working at Richards’ Los Angeles radio station KMPC. Richards proposed a coin toss. If Richards called it right, Reynolds would play two years for the Lions and work at KMPC in the off-seasons. If Reynolds called it right, he would have the radio job without any obligation to play for the Lions. Richards won the coin toss, and Reynolds signed a double contract- to play football for the Lions in the fall and to work for KMPC in the off-seasons. 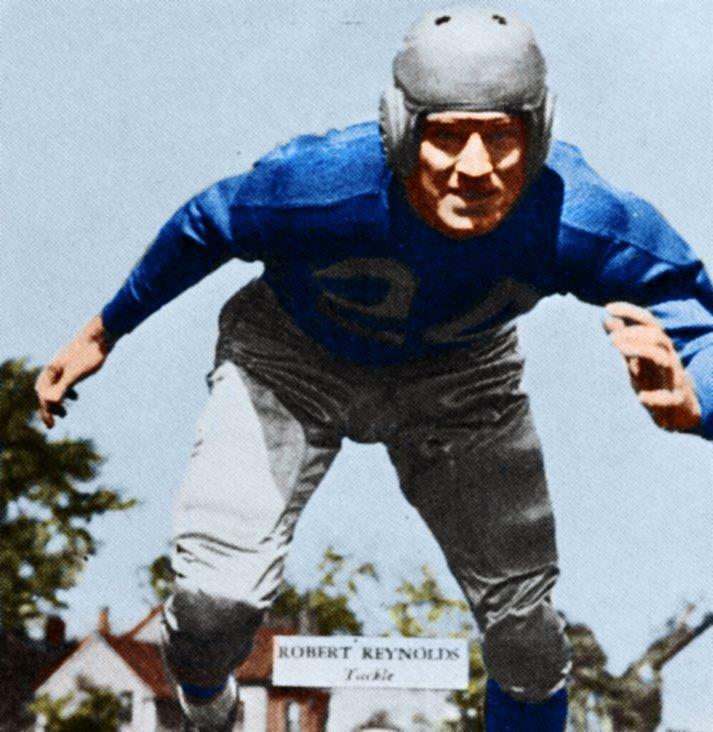 Reynolds played 20 games as a tackle for the Lions in 1937 and 1938. During theoffseason in 1938 Reynolds joined the sales staff of Richards’ Los Angeles radio station KMPC. In 1942, Reynolds was named Vice President and General Manager. When Reynolds joined KMPC, it was a small 5,000-watt station. In 1947, KMPC received approval from the FCC to increase its broadcasting power to 50,000 watts making it Southern California’s most powerful independent radio station. In May of 1951, Richards died, leaving the station under the management of Reynolds and Loyd Sigmon. Reynolds contacted Gene Autry, the famous Cowboy and Hollywood actor, and advised that he had the inside track to acquire the station and its valuable real estate holdings from Richards’ widow. Autry and Reynolds acquired the station together and founded Golden West Broadcasting. Golden West eventually owned and operated KMPC radio and KTLA television in Los Angeles and KSFO in San Francisco. Reynolds served for many years as the president of the company. Reynolds was also a co-owner, vice president and a director of the Los Angeles Rams football team from 1963 until 1972. In 1966, Reynolds led a group of five Rams owners, each representing 8% of the shares, in advocating the establishment of an NFL franchise playing at Anaheim Stadium in Orange County, California. The Rams would eventually move to Anaheim for the 1980 season. Reynolds died on February 8, 1994 in San Rafael, California at age 79. 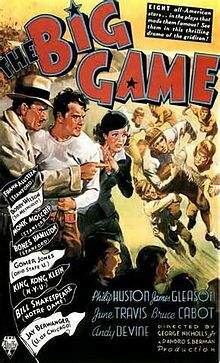 The Big Game was directed by George Nicholls, Jr. and produced by RKO Radio Pictures, which released the film on October 9, 1936. The screenplay was written by Irwin Shaw, adapted from the 1936 novel of the same name by Francis Wallace. The film starred Philip Huston, James Gleason, June Travis, Bruce Cabot and Andy Devine. The simple plot of the story revolved around Clark Jenkins the star quarterback ofAtlantic’s college football team. He falls in love with classmate Margaret Anthony, whose father, Brad, is a newspaper sports columnist who disapproves of their romance. A gambler and school booster, George Scott, has been discreetly giving money to Clark, as he has in the past for players like Pop, who couldn’t have afforded to go to college otherwise. Clark’s roommate and teammate, Cal Calhoun, snitches on him and falsely concludes that Clark intends to deliberately lose a game for a payoff from gambling kingpin Blackie Dawson. No such arrangement exists. But with the big game against Erie coming up, Blackie kidnaps Clark to make sure Atlantic can’t win. Pop creates a distraction on the field to delay the proceedings while Margaret, George and an apologetic Cal rush to rescue Clark in time to play in the game. 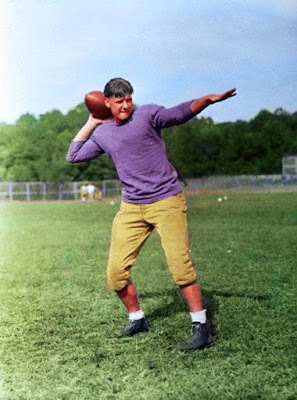 The group of college All-Americans, that included Heisman Trophy winner Jay Berwanger, shot football scenes for several weeks in late July and early August of 1936. Several of the movies football scenes were clips from the 1935 Rose Bowl game. But Berwanger was not excited about the process of movie-making, “They are always stalling around,” said Berwanger to the Chicago Tribune. He did like the money though, as he pocked $600 for the six weeks of work.